Here we take a look at long haired Siamese cats, as well as other long-haired and short-haired cats related to the breed. We also look at other cats that may seem like related breeds of Siamese cats, but which actually aren't. The Siamese cat breed has lent its genes to so many cats that now have their own breed names. Let's start with the long-haired relatives. The Balinese cat breed really is a long haired Siamese - it was developed from the long haired kittens that occasionally appear in Siamese litters. These long haired kittens were thought of as accidental, but in the 1940s two US cat breeders began developing them into their own distinct breed. Balinese look like Siamese cats with long silky coats and distinctive plume-like tails. Blue Lynx Point Balinese, note the fluffy tail! The Javanese cat is similar to the Balinese. Also long-haired with feather-like tails, there's confusion surrounding Javanese cats. 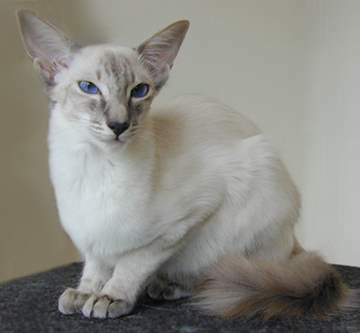 The Cat Fanciers' Association considers Balinese cats found in any colors other than the four main point colors of Seal, Chocolate, Blue and Lilac to be Javanese. In other words, the Red, Cream, Lynx and Tortie point colors would all be Javanese. But in Europe, the name Javanese is sometimes given to long haired Oriental (one-colored) cats, too. Hence the confusion! 'Himmies' are a Siamese/Persian cross. 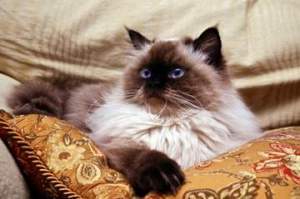 Their body type is stocky like a Persian's and their coat is thick and long, but their coloring is pointed, making them look like long haired Siamese cats. I must confess to a weakness for Himalayan Persian cats, these are absolutely gorgeous cats! They have fluffy tails, thick ruffs around their necks and bright blue eyes. Snowshoes (often, mistakenly, called Snowshoe Siamese) were first developed in the United States through the breeding of Siamese cats with American Shorthairs. Their body shape combines the stocky build of the American Shorthair with the body length of the Siamese, and like their Siamese forebears they have short coats and brilliant blue eyes. Their distinguishing features are their four white paws, from where they get the name Snowshoe, and a white inverted 'V' over their noses. The Tonkinese cat breed is a cross between the Burmese and the Siamese. Like their Siamese cousins, Tonkinese are pointed cats, having dark colorpoints that blend into their body color. Their coat color is somewhere between the Burmese and the Siamese – not quite as dark as a Burmese, but neither is it quite as light as a Siamese! Their eyes should be a greeny-blue or aquamarine, not the brilliant blue of Siamese eyes. Birmans are often mistaken for a long haired type of Siamese, but are more likely to be a completely separate breed, said to have originated in Burma. Their history is rather mysterious! 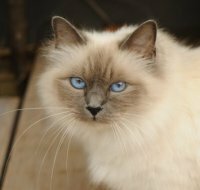 The Birman cat breed first appeared in Europe in the 1920s, and although modern-day Birmans may have some Siamese genes, this is by no means certain. 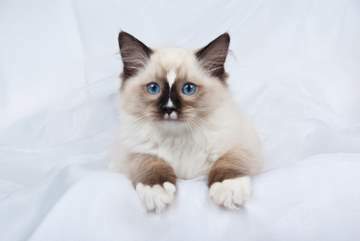 The long haired Birmans have bright blue eyes, silky coats and color points, but their most distinguishing feature is their snow-white feet, similar to the Snowshoe's. The Ragdoll cat breed is also sometimes mistakenly known as a long haired Siamese breed. The founding Ragdoll queen was actually a long haired white cat who was injured in an accident. Her kittens were found to relax completely when cuddled, making them floppy like the rag doll from which they get their name. Ragdolls are large cats with long silky coats and bushy tails. There are three varieties, the Mitted, the Bicolor and the Colorpoint. Cat Breeds Junction has loads of useful information on cats from A to Z, from all over the world. Rescued pregnant Siamese cat - is Zoey a Snowshoe?